As you may know, our team member, Callum Thomson, was admitted to the Roll of Solicitors of England and Wales on 1st March 2017. 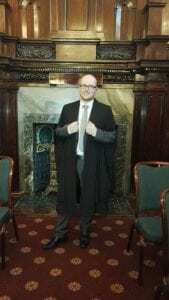 Well, on 27th October 2017, he travelled to The Law Society on Chancery Lane, London, for his Admission Ceremony! The ceremony involved entering the grand, rather opulent, Reading Room of the Law Society. The Chancery Lane building first opened its doors to the members in 1832. Upon entering the room, Callum received a certificate and put on his robe, before having his photographs taken with his family. The Toastmaster then greeted the solicitors and guided them to the Common Room wherein the ceremony took place. The solicitors listened intently to the insightful speech of the Vice President of The Law Society, Christina Blacklaws, before individually joining her on stage to be commended on their graduation. After the ceremony, the members’ families and friends explored The Law Society before enjoying Champagne and nibbles in the Reading Room. It was a thoroughly enjoyable day! We wish Callum the very best in his well-deserved career!